The melodious sound of birds chirping in the canopy above complimented the early morning light. 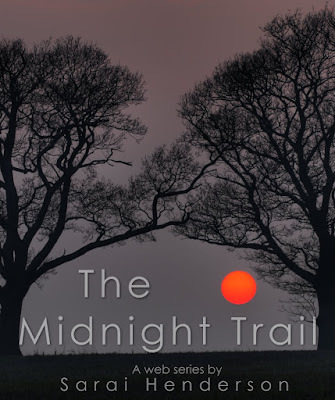 Once I had stepped through the gateway to the Midnight Trail, it was like I was in a whole other world. The light seemed brighter here, the birds sang sweeter and the shades of green seemed more vibrant. I couldn’t help but smiling at the joy around me. The path wound its way through the underbrush, along a stream that bubbled with fresh water. I stopped for a moment and touched the surface with my finger tips. I hadn’t expected the cold shiver that ran up my back. It must have been runoff from the mountain nearby, but it was summer. I had thought it would be somewhat warmer, another surprise on the trail. It had been an hour when I stopped for a break. The path had been fairly easy and well worn as it twisted through the forest. By my calculations I had already gone several miles and I was making good time. If I could keep up this pace for another hour or two, I might make the end of the trail before lunch time. There was a fallen tree on the side of the path that beckoned me to rest on it. How could I say no to such an offer? I let my backpack rest at my feet and pulled my water bottle from its pocket. As I drank, the underbrush behind me began to rustle. At first, I didn’t notice it because it was so slight, but as it became lauder, my mind began to wonder what was coming closer. I jumped to my feet tripping over my backpack and falling to the ground. From the sound of limbs snapping and the amount of rustling that was coming toward me, I expected a bear or a mountain lion, Bigfoot even to come charging onto the path. My heart raced as I tried to stand only to be surprised when a doe and her fawn jumped from the forest and bound across the trail to drink at the stream. I told myself that even though I didn’t believe it one hundred percent. There was always something out there that was coming for you. No one was immune to it, not me, not even Jarrod my twin brother. The day that he died I had found myself on the ground a lot like I was now. We were crossing the street in Downtown Portland, headed to the water front to partake in the festivities of the Rose Festival. The cross walk turned green, I stepped out into the street not noticing the car that had just ran the red light on the other side of the intersection. Jarrod pushed me out of the way just as the vehicle struck him. That was the last time I saw him alive. That was the reason I was here on the Midnight Trail, to try and forget that horrible sight. I pulled myself to my feet and dusted the dirt off my pants. The feeling of ease was gone, replaced by the weight of my loss. This was going to be a long day. Do you think Shelby will ever be able to forgive herself for her brother’s death? Find out what excitement awaits her on the Midnight Trail.